A comprehensive collection of the most defining and fundamental drum styles for classic songwriting. 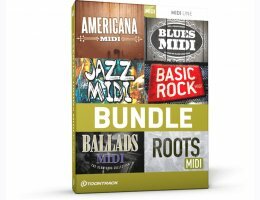 This bundle comes with six individual drum MIDI packs from the Toontrack catalogue, in some cases miles apart musically, but combined all serving a higher purpose: To cover the most defining and fundamental styles of drums in classic songwriting. Find anything from the subtile and focused americana style or the touch and feel of blues to the inimitable nuance and timing characteristic of a great jazz player. The Essential Drums MIDI 6 Pack paints a comprehensive picture of varying drum styles and serves as the perfect match for the creative songwriter looking for easy-to-use MIDI that seamlessly falls right in to any project or song. When you have the drums, you’re halfway there. The rest of the canvas is blank and for you to fill. Start creating – it’s EZ!